The well-known Reuters dates from a text news service founded by Julius Reuter in 1851. He established an office to transmit information between the London and Paris stock exchanges. The Reuters Company operated in Australia from 1860. By 1869, the Company had obtained exclusive rights to Australia and the Far East. For the first few years, Reuters operated though its appointed Agent Greville's Telegraph Company. It then operated independently as a Telegraphic Company in Australia for a number of years. (Further background at http://ketupa.net/reuters.htm). The focus of its service was solely concerned with messages between England, other Reuter’s bases in the British Empire and Australia and not with domestic services. In 1872, the cost of a cable to London was 10/- per word. An agreement to supply news to major Australian dailies took effect from 21 October 1872. There was an exclusive arrangement between Reuters and Australian Associated Press which in turn allowed the Argus and the Sydney Morning Herald to be the only newspapers to receive the foreign news. John Byron, who had formerly worked at Greville's, opened an office in 1877 in London to provide foreign news to those newspapers who had been excluded from the arrangement. Reuters offered to buy Byron out but he refused. Reuters soon began to regret the exclusivity of the arrangement and tried to modiy their contractual obligations. Reuters profitability in Australia depended not so much on the news services but on commercial activities, especially private telegrams. The continuing dominance of the telegram over other forms of communication was reiterated when Reuters reported the Armistice which ended World War I in many places of the world even before the British Government’s official announcement. Location of Reuters Offices in Australia. The company opened Offices in Melbourne (Central Office in Australia), Brisbane, Sydney,Hobart, Launceston, Adelaide and Perth. REUTER'S free Cable Addresses embrace both sender and receiver.Great economy effected by using Reuter's new code of half a million phrases. Messages in this code translated before delivery. Mail and telegraphic remittances at lowest rates to all places within and beyond Australasia. As would be expected, the Company used advertising at every opportunity. A very nice advertisement was the use of collar stamps on mail. It is not known whether all mail was treated in this way or just special mail. 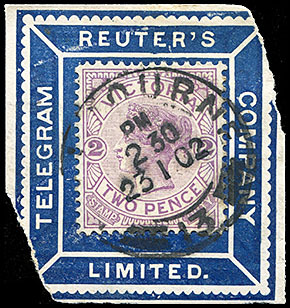 The rare collar stamp shown at the right has a 2d violet Stamp Duty modified Naish design first issued in 1886. The final printing was made in January 1901 from which this stamp has probably come. Size: 45 × 41 mm. Reuters Collar stamps containing a 2d Naish Stamp Duty Naish design. Overview of overseas Telegraph Companies.